Every given year there are between two and five solar eclipses, this upcoming one for August 21st will be special. The last total solar eclipse for North America goes back to 2008. As Earth is largely covered by water, many of the eclipses are over the ocean where the number of viewers are limited. But this one will pass over millions of people, all with access to equipment and social media to share their experience. Hence this one has lots of people planning and getting ready. The eclipse is most impressive when you’re located in the path of totality; where the Moon completely blocks out the Sun. Hence if you are able to travel to such a location along its path, it will be worth it. I also suggest finding a local astronomy group or association as they will most-likely have telescopes and other special observing gear out for everyone to use. 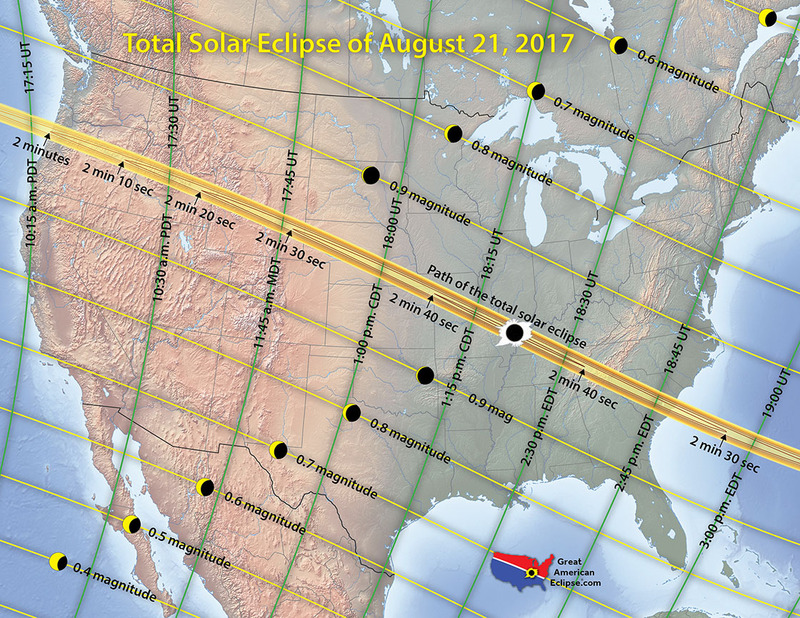 The total solar eclipse will only be viewed in the narrow path crossing the middle of the USA. North and south of that will get a partial eclipse. The green vertical lines indicate the time of maximum eclipse. Courtesy Michael Zeiler, GreatAmericanEclipse.com. Observing the solar eclipse requires protective eye-wear and solar filters for any observing or photographic equipment. For my telescope it’s a film solar filter, now branded SolarLite by Thousand Oaks Optical. These can be purchased already mounted in an aluminium cell or in sheets for your own custom application. The American Astronomical Society has created a web site just for the event with plenty of information on safe observation and suppliers of necessary optical filters. This entry was posted in Events, Observing and tagged 2017, Astronomy, Science, Solar Eclipse, Telescope by Benoit Guertin. Bookmark the permalink.